Also serving communities of Pomona. There are 21 Assisted Living Facilities in the New City area, with 3 in New City and 18 nearby. The average cost of assisted living in New City is $5,190 per month. This is higher than the national median of $3,346. To help you with your search, browse the 118 reviews below for assisted living facilities in New City. On average, consumers rate assisted living in New City 4.1 out of 5 stars. Better rated regions include Pearl River with an average rating of 4.7 out of 5 stars. Caring.com has helped thousands of families find high-quality senior care. To speak with one of our Family Advisors about assisted living options and costs in New City, call (855) 863-8283. Seniors who enjoy gardening may like exploring New City's Dutch Gardens, which were designed in the 1930s and have won national recognition. After taking in the teahouse and flowers, seniors can return home to one of the area's 21 assisted living facilities. These are regulated by the New York State Department of Health. and are known as Adult Care Facilities or Assisted Living Residences, depending on their license. The New City area is home to world-class medical facilities, including Montefiore Nyack Hospital, in the event of medical emergencies or illness. Transport of Rockland (TOR) provides bus services in New City and passengers aged 60 or older are eligible for discounted fares. TOR has a paratransit service called TRIPS. Seniors may be eligible for this service, which offers curbside-to-curbside, shared transportation. Social Security benefits and select public pensions are not subject to income tax in New York. Other forms of retirement incomes are taxable, but there is a large deduction available for taxpayers aged 60 and over. Sales taxes in the state are high, which can impact the budget of seniors, although medication, groceries and some clothing items are exempt. The overall cost of living in New City is 173 on Sperling's index, 73 points higher than the national average of 100, largely due high housing costs. While everyday expenses are higher than the national average, it's by a lesser amount. Groceries are around four points higher than the national average and healthcare is rated two points higher. Seniors may find their budgets impacted by these higher costs. New York State, including New City, is a member of the AARP Network of Age-Friendly Communities, meaning that its elected leadership “has made the commitment to actively work toward making their town, city or county a great place for people of all ages,” according to AARP. The overall crime rate in New City is 13 crimes per 1,000 residents, which is higher than 69 percent of other towns and cities in New York. However, the rate is lower than average for similarly-sized communities across the United States. Both the violent and property crime rates are lower than the state average, which may reassure safety-conscious seniors. Assisted Living costs in New City start around $5,190 per month on average, while the nationwide average cost of assisted living is $4,000 per month, according to the latest figures from Genworth’s Cost of Care Survey. It’s important to note that assisted living rates in New City and the surrounding suburbs can vary widely based on factors such as location, the level of care needed, apartment size and the types of amenities offered at each community. 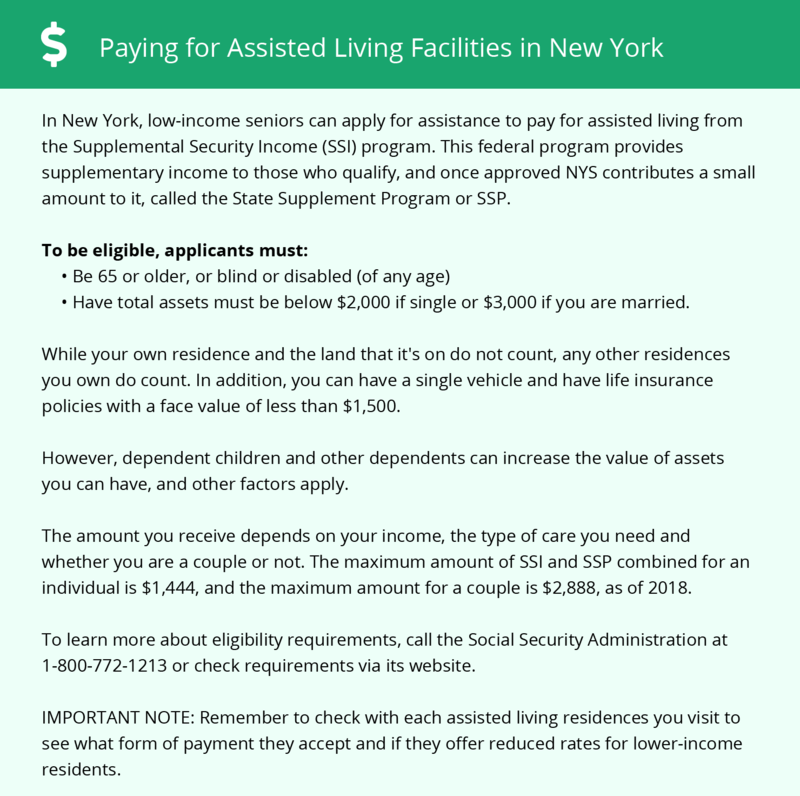 The Assisted Living Program (ALP) offers financial assistance to New York seniors in assisted living, although it's only available to a limited number of people. The Optional State Supplement (OSS) is also available to people in New City who receive Social Security benefits. New City and the surrounding area are home to numerous government agencies and non-profit organizations offering help for seniors searching for or currently residing in an assisted living community. These organizations can also provide assistance in a number of other eldercare services such as geriatric care management, elder law advice, estate planning, finding home care and health and wellness programs. To see a list of free assisted living resources in New City, please visit our Assisted Living in New York page. New City-area assisted living communities must adhere to the comprehensive set of state laws and regulations that all assisted living communities in New York are required to follow. Visit our Assisted Living in New York page for more information about these laws.